While House Republicans are exiting in historic numbers, only two of their senior colleagues in the Senate have announced retirements, although both - at least in name - in rebuke of the Trump Administration. 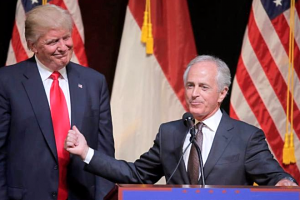 Senator Bob Corker (R-TN), who may be gearing for a Presidential run, became the first Senator up in 2018 to announce his retirement, followed by Senator Jeff Flake (R-AZ) who made his announcement from the Senate floor, denouncing the "complicity" of his own party in an "alarming and dangerous state of affairs" under Trump. While there are rumors of more, the pressure is on for Republican Senators to stay put in the name of preserving their slim 52-48 majority. The Republican Party holds a 52 to 48 seat majority over the Democrats (including two independents) in the US Senate. Democrats will need to pick up a net gain of three seats to take the majority in 2018. The last hope for chipping away at the GOP majority before the regular election November 6, 2018, are Special Elections -- for seats vacated mid-term, which need to be filled by calling a "special" election, usually within three months of the vacancy. At present only the turbulent Alabama Senate Special to fill Attorney General Jeff Sessions' former seat is on the docket. The December 12th election is in the hands of Republicans at present, but the sensational sexual allegations surrounding ultra-right Republican nominee Roy Moore may shift the dynamics in the days to come. Other retirement possibilities include Senators John McCain (R-AZ) and Thad Cochran for health reasons, and Senator Bob Mendenez (D-NJ), depending on the outcome of his current trial. A total of 33 of the 100 US Senate seats will be up for election November 6, 2018. The Democratic Party will be defending 25 seats (including two Independents), while the Republicans have only eight to protect. Even with the mid-term advantage of the party outside the White House, the challenge of retaining, and expanding on 25 seats is daunting for Democrats and, in particular, those running in states like Indiana, Missouri, Montana, North Dakota and West Virginia, where Trump won in 2016 by double digits. Still, most incumbent Dems are favored to be re-elected and, with the current White House, everything is possible. Ratings based on review of The Cook Political Report, Sabato's Crystal Ball, Inside Elections, and DemList' final call. Help DemList with a Contribute Here. With the final “super Tuesday” 6-state primaries and caucuses June 7th, Sanders and Clinton have unleashed a wave of campaign ads. State Parties are the core of the Democratic party infrastructure and their individual effectiveness and success..